Women Across Frontiers (WAF): How has the rate of femicide in Argentina changed in recent years? Casa del Encuentro (C): Since 2008, the Asociación Civil La Casa del Encuentro, through the femicide “observatory” (Observatorio) “Adriana Marisel Zambrano,” has issued an annual report on femicide in Argentina tracking number of women killed in the country each year. Unfortunately, the average remains the same: A woman dies every thirty hours because of sexist violence. WAF: How do Argentina’s state policies concerning femicide compare with those of other countries in Latin America? C: Argentina is the only country in Latin America to have state policies protecting women’s rights Since 2010 Bill 26485 has provided comprehensive protection to prevent, punish and eradicate violence against women. The legislation details every form of such violence and the procedures that should be used to intervene in such cases. Unfortunately, it is insufficiently comprehensive and it has never been consistently enforced. In 2016 the National Council for Women—an organization created by the aforementioned law—presented to the government the National Plan to Prevent Sexist Violence in order to address these shortcomings. WAF: Casa del Encuentro has presented the Brisa Bill. What does this proposed legislation provide? C: The Brisa Bill calls for the government-paid reparations for the daughters and sons of victims of femicide. Recipients must be younger than eighteen and/or have a disability. Payments, made monthly, are to be equal to a minimum state pension. WAF: Could you elaborate on these payments? The criminal action against the father on the investigation of the mother’s murder has been declared extinguished because of her death. We consider these payments to be reparations, not benefits or allowances because we hold the state accountable for the crimes since it’s the one who has signed international treaties protecting children and teenagers. These reparation will be compatible with any other pension or allowances already provided to them. The Brisa Bill designates the daughter or son as right holders from the moment the judge in each case determines who the child’s legal guardian is to be. The guardian himself or herself will receive the reparation on behalf of the child. In no case can the murderer himself or any accomplices involved administer the reparations. WAF: Comprehensive sexual education is regulated by law, but it has been proven to be woefully ineffective at stemming violence against women in Argentina. Why is this and what can we do about it? C: There are two problems. First, the laws that do exist are not consistently enforced; second, the root cause of sexist violence—the belief that women are inferior to men, should be subservient to men, and should not have the same rights as men—have not been eliminated in our society. In order to fix these problems we need better law enforcement. But more important, we need to make all the stakeholders in our society—from parents to healthcare providers to attorneys and judges—aware of the role that sexist beliefs play in this epidemic of femicide. This will not be easy as these beliefs are often subconscious and deeply ingrained. But we must teach our children to reject cultural biases against women (and girls), and we as adults must acknowledge and reject these biases in themselves. If we can do these two things, we will greatly reduce femicide in Argentina. It is incumbent upon us that we try. On June 3, 2015, 300,000 demonstrators convened in the Plaza del Congreso in the city of Buenos Aires, united by a common cause: Ni Una Menos (“Not one more”). 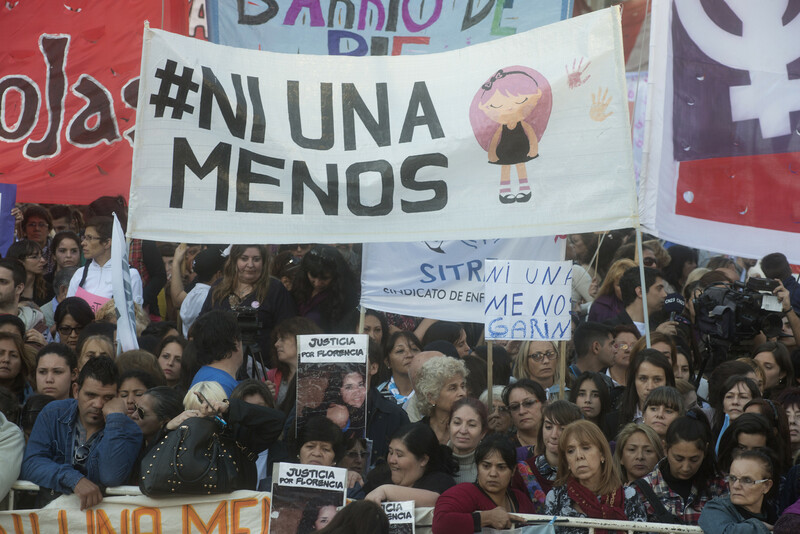 The massive protest demanded an end to femicide and insisted on the adoption of policies to defend women victimized by gender-based violence. Protestors also gathered in 120 parks and streets across the country, waving flags and holding signs and photographs of the victims. From that moment, Argentina would treat the issue in an entirely different way. Source: https://wafmag.org/2015/11/femicide-in-argentina/. The bill also calls for the government to provide health insurance for these same children should they not have insurance from other sources—insurance that would address the children’s psychological as well as physical needs.